Russian government, religious and human rights dignitaries joined more than 2,000 Scientologists to mark the grand opening of the Russian Federation’s premier Church of Scientology of Moscow. The new home for the Church of Scientology of Moscow was dedicated before more than 2,000 Scientologists, Russian government, religious and human rights dignitaries. 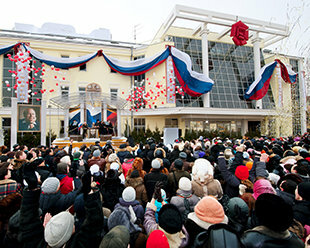 The ceremonies marked the grand opening of the first major Church of Scientology in the Russian Federation. Following the grand opening of the Church of Scientology of Moscow, Scientologists, guests, and community and civic leaders gathered in the Church’s three-story skylit atrium. Scientologists and guests toured the new home of the Church of Scientology of Moscow immediately following its grand opening ceremonies. The Church serves Moscow’s Scientology congregation, providing ideal facilities for religious services and is also open and available to all members of the community. The new home for the Church of Scientology of Moscow stands within the city’s central Garden Ring, just a mile from Red Square. This new building is the premier Church of Scientology in the Russian Federation. 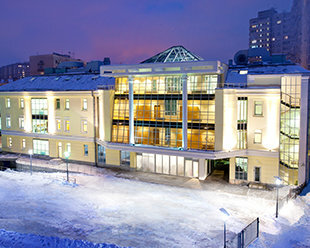 The centerpiece of the Church of Scientology of Moscow is its three-story glass and steel atrium. The atrium houses public conference facilities and a café for parishioners and visitors. The Church of Scientology of Moscow serves as a center for all faiths to unite in the name of religious freedom. The Church provides public conference rooms for the use of religious and community groups. The Church of Scientology of Moscow is open to visitors every day. All are welcomed to tour the Public Information Center to learn about the fundamental beliefs and practices of the Scientology religion and its community outreach and humanitarian programs. The Public Information Center in the new Church of Scientology of Moscow presents more than 450 films that provide an introduction to Dianetics and Scientology, as well as the many Church-sponsored social betterment and humanitarian programs. The Church of Scientology of Moscow’s Public Information Center features an exhibition dedicated to the life and legacy of Founder L. Ron Hubbard. All congregational gatherings are convened in the Church of Scientology of Moscow Chapel—Weddings, Naming Ceremonies (christenings), and Sunday Services. The Chapel further serves as a venue for community events and functions. Moscow’s Scientology Chapel is the site of all religious Church services and also hosts public gatherings, including community banquets. As is traditional in all Churches of Scientology, an office of L. Ron Hubbard stands in honor of Scientology Founder, L. Ron Hubbard, and symbolizes that this Church is true to his writings and ideals. Thousands gathered in Moscow to open the first major Church to open in the Russian Federation. The building stands in the city’s central Garden Ring, just a mile from Red Square. The new Moscow Church not only meets the needs of its growing congregation of Scientologists, but also serves as the center for all faiths to unite in the name of religious freedom. The Church of Scientology Moscow The new home for the Church of Scientology of Moscow stands within the city’s central Garden Ring, just a mile from Red Square. This new building is the premier Church of Scientology in the Russian Federation. With the new Church of Scientology of Moscow, so begins the next historic chapter for Scientology. It is a chapter that not only signifies a renaissance for the religion itself, but a new era for religious and human rights in Russia.